Today is Mother-in-law Momism Monday. My MIL Elizabeth or Lizzie was a character. She passed 17 years ago but I can still hear her saying some of the funniest and sometimes PG13 rated momisms. Her sense of humor was blunt yet contagious. You couldn't help but laugh with her. Her laugh started with a yodel and ended with a sigh. This post is in honor of what would have been her 91st birthday. She's beautiful and he's so handsome. Just a couple of good looking people. My father-in-law Claude lived to be 86 years young. He gave good advice. I miss them. 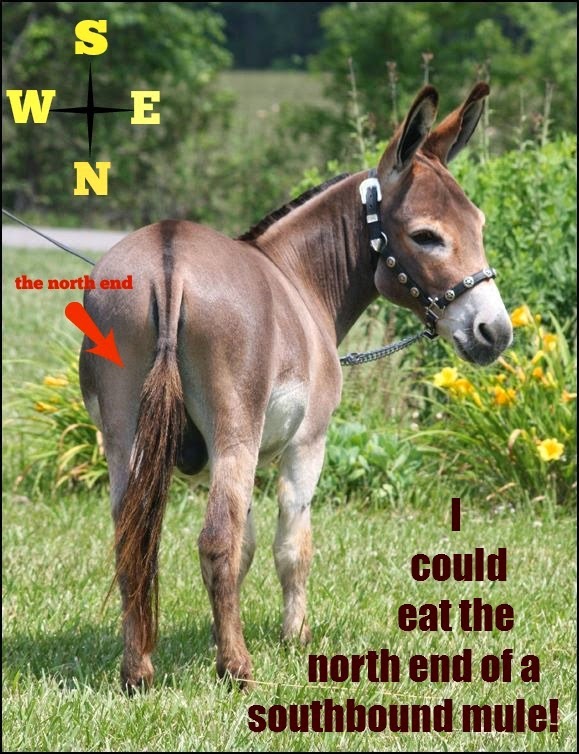 I'm so hungry I could eat the north end of a southbound mule! That is hilariously hungry! Have you ever been THAT hungry? Leave me a comment and let me know. Have you ever heard this momism?